What Is A Good Beginner Ukulele? The concert sized ukulele is larger than the soprano, at around 23". Being a bit longer, it is a little louder and richer in tone, and of course, easier to play for those who do not have small hands. My favorite concert sized are the Cordoba 15CM, Kala KAA15C , and Oscar Schmidt OU5 Koa wood. The Oscar Schmidt OU5 Koa is a beautifully crafted Uke made from Koa wood. It's my personal favorite for it's tone and appearance. 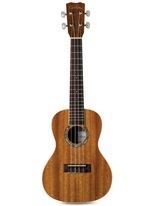 ukulelebuyingguide.weebly.com is a participant in the Amazon Services LLC Associates Program, an affiliate advertising program designed to provide a means for sites to earn advertising fees by advertising and linking to Amazon.com.